In the front row, sweat-soaked victims braced themselves against stage-diving kicks to the face that caused noses and gums to gush. 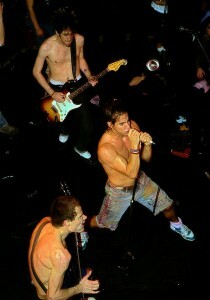 On stage, the Red Hot Chili Peppers tore shirtless through songs off recently released The Uplift Mofo Party Plan. It was 1987, Flea had maybe one tattoo, Hillel Slovak was still alive and Orlando photographer Jim Leatherman drove six hours to plant himself in this seedy part of Atlanta to watch the Chili Peppers’ bloody blossom. From the second story of the venue where Leatherman perched, his shutter snapped an overhead perspective of an intense shared experience – a memory that three years later, when the Chili Peppers played Visage Nightclub in Orlando, brought singer Anthony Kiedis to tears when Leatherman showed up with the photos. Leatherman approached the rock star and shyly gifted him the photos, planning to simply pass them on and then back off. (Note that while his camera intrudes fearlessly to catch intimate moments during pivotal performances, Leatherman’s social demeanor is humbly unobtrusive.) Instead, Kiedis barked for him to come closer, and the pair sat for nearly half an hour while Kiedis went through the photos and reflected on his friendship with original Chili Peppers guitarist Slovak, who had died between the Atlanta show and the Orlando date. According to Leatherman, Kiedis cried off and on during the exchange. The exhibition runs from its opening today (April 16th 2015; exhibition opens at 6 p.m) until May 15th at the City Arts Factory, 29 S. Orange Avenue, Orlando, Florida. This entry was posted in Anthony Kiedis, Flea, Past Band Members by Squitherwitch. Bookmark the permalink.